How can one create a HMI with multiple pages and links to navigate between them? If you are using RexHMI for Inkscape, then right-click on any object -> Create link, right-click again -> Link Properties -> fill in the Href field... This object then becomes a hyperlink to another webpage. you have to specify the webpage in the Href field. Be sure that the webpage is accessible in your web browser (i.e. both html pages are present on your target device). Thanks for the info. I have multiple .svg pages which I need to export to the same UNIPI; I also need to navigate between the html pages, once uploaded to the target device. I can import multiple .svg pages and then export but I would prefer to navigate with the use of a button and I am not sure how to do that? e.g. in page1.svg, put /page2.html into the href field. In page2.svg, put /page1.html into the href field. This will allow you to switch between 2 pages, provided that page1.svg is set to export to page1.html and page2.svg to page2.html. Thanks All, was missing the "/"
After a long time not having worked with RexControls, I'm back in and want to create as well a mulipage HTML file. 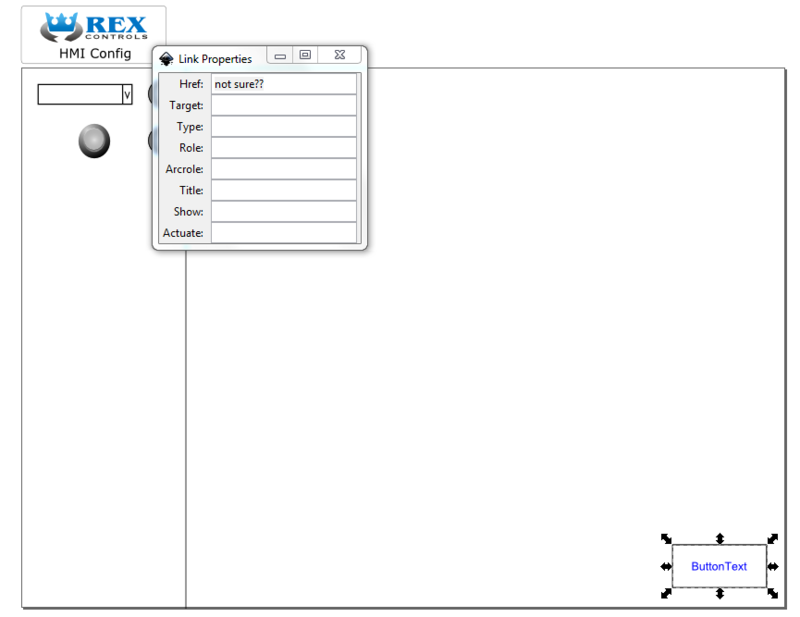 I have created 4 pages with 4 pushbuttons named Page 1, 2, 3 and 4 and linked them as listed above in the href field to "/page1.html" up to "page4.html" by simply exporting it (it will become index.html) and renaming it to page1.html, page2.html etc. However it seems that is not working in this way when I simply open the page1.html in a browser and click on any of the 4 pushbuttons. I have attached the zip file with the svg files and the HMI directory for your reference. Hopefully you can help me to get this "basic" sorted out for me. welcome back! The buttons are meant for controlling variables in your algorithm. To create a hyperlink, please use any standard object (circle, rectangle, text, etc.) and define the hyperlink. Thank you very much, I will have a look and come back to you if I"m facing any problems. Thanks once more, it is working very nicely now with your instructions and great example.